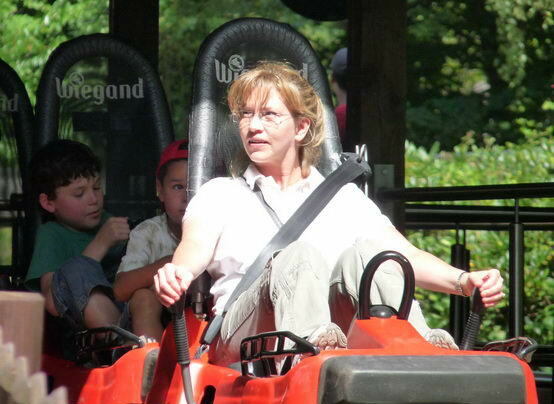 On a recent trip to France, Joan and I stopped at a wild animal / amusement park in the middle of a forest. It was a beautiful park in a picturesque valley surrounded by tall trees that seemed to reach up and touch the sky. It was in this majestic place of splendor and tranquility that I came face to face with one of my most powerful phobias. And it was there that I tried to overcome my fear. I failed. In the worst imaginable way. 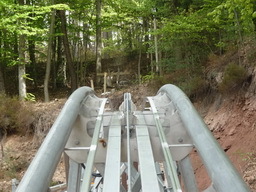 At this park there is a roller coaster type ride that takes a steep climb up the side of a mountain and then it freely sails back to the bottom. Sounds like easy fun, right? I thought so, too. I don’t like roller coasters. I tend to avoid them at all costs. They scare the living crap out of me to put it plainly. No loops for me, thank you very much. But this one seemed harmless and, hey, there were small kids riding it as well. I thought that it would be a great way to face one of my fears. I asked Joan to ride with me and we hopped into a two seated car. I felt wrong almost immediately and noticed two large sticks poking out of each side of the car. They were breaks. Why do we need breaks? I wondered. As we started our climb I felt a lump in my throat form and my entire body braced. Fear had suddenly found me out there in the wilderness and it was taking control. As we continued our ascent, I told Joan I couldn’t do this. But it was too late! Joan tried to calm me as much as she could, bless her heart, but it wasn’t working. Once fear grips me I become rather irrational and can no longer listen to reason. Then I heard the screams! No, not just the ones inside of my head. Kids were screaming on the ride down the mountain. It was then that I really started to panic. Nevermind that the kids were screaming from pleasure and fun. When we reached the top of the mountain I quickly unstrapped and jumped off the car before it started to sail back down. Yes, you read that right. I jumped off! As someone with ADHD I have learned how to deal with embarrassment, but I still have not learned to overcome one of my greatest fears. There I was standing at the top of this mountain with no obvious path to go back down. I looked around me. All ways were blocked by rollercoaster tracks. I was now in a truly dangerous situation. I had to find a way or call for a rescue helicopter, but I wasn’t ready for that much embarrassment. There’s only so much a person can take, you know. But something odd happens to me when I am in real danger (as you noticed, I usually put myself in said danger). Phobia is one thing, true danger is another – somewhere inside my head the difference is understood. When in real danger my ADHD brain clicks into control and embraces the risk. In such situations it becomes a life saver. I found a portion of the tracks that formed a sort of bridge that I could crawl under and from there I began my long, treacherous climb back down the mountain. After a while it became less embarrassing and rather funny watching the people going up giving me weird looks. I waved and smiled. What else could I do? It seemed to take forever, I climbed over and crawled under several obstacles on my way down, but I did it! Going down the mountain, with my feet on the ground I wasn’t scared in the least. I was totally immersed and hyper-focused. It was then that I understood the exhilaration those screaming kids must feel as they ride down in the safety of the their roller coaster cars. By all rights, I should have been scared out of my mind. What I was doing was insane. I was almost run over and I slipped a couple times and once it could have been the end if I hadn’t found my grip in the last possible second. I didn’t realize it at the time but I had gained an audience watching up from the base. When I finally made it to the bottom I was greeted by park personnel and they immediately started chastising me. I deserved it, but I didn’t care. I was at the bottom and I had survived. I started searching for Joan. Where was she? Seconds seemed like minutes and then there she was in my arms so happy I made it okay. She was so proud of me and she told me how amazing I am. No wonder I love her so much! I’ve done things like that before and I never had such a positive reaction. What was done was done and she embraced me for who I am and what I needed to do. But I am not about to do it again anytime soon! Well, I hope not. The rest of the day at the park was spectacular. 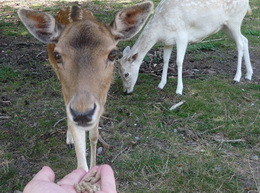 We had the opprotunity to feed deer as they walked up and ate out of our hands! I truly believe I can thank my ADHD for allowing me to embrace the very real risk that presented itself, even if I created the risk. You may believe the jump from the car was impulsive, and it was, but anyone with phobias can attest to how powerful and controlling they can be. I don’t care what anyone says. I know ADHD saved my life that day. Have you been in a situation where ADHD actually helped you? *The photos are actual photos at the park. The top photo is my wife, Joan, getting ready to go up the mountain for another ride. As you can see, I am not on it! Next post: 5 Steps To Get What You Want, Even If You Have ADHD!